Irian Jaya [see map] is the Indonesian half of the island of New Guinea. According to National Geographic, it is one of the last places on earth where there are still uncontacted tribes. 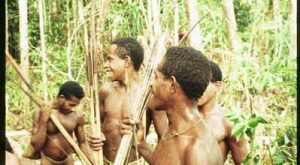 Indeed, Reuters reported in 1998 that two new tribes (the Aukedate and the Vahudate) were discovered in the remote mountains near the border with Papua New Guinea. In a different part of the island live the Kombai. Although most of the tribe has had limited contact with the outside world since their “discovery” in the seventies, there are reports of still uncontacted clans living hidden in the jungle. In 1997, a friend and I visited some remote Kombai clans and found them virtually untouched by the modern world. We chartered a small bush plane to fly us several hundred miles into the roadless jungle. The pilot landed on a lonely dirt strip, unloaded our packs, and promptly took off saying that he would try to be back in a week to get us. We spent the rest of the day recruiting some of the Kombai that were living near the airstrip to be our porters. We were told that we were the first people to have landed there in over a year. The next day we hiked off into the jungle in search of remote clans. After several hours we were told that we were nearing a village, and we decided to wait while one of our porters ran on ahead. My friend had made the mistake of entering a village unannounced the year before and had found fearful villagers aiming drawn bows at her. We did not want to repeat that mistake and waited for permission. While we were waiting, I broke out some postcards of my home city of San Francisco. I wanted to show our porters what life was like where I came from. I saw some of them, however, looking at the pictures upside down. They had no frame of reference to understand what they were looking at. They had never seen buildings, or bridges, or cars. After about half an hour, a group of young warriors approached from the village. They were very quiet at first. They didn’t know what to make of us. For at least some of them, we were the very first people from outside of their jungle that they had ever seen. After awhile, the men began to relax and led us to their village. We were told that we were the first outsiders ever to enter it. Moments after we entered the village, we saw a group of men running at us with drawn bows and yelling fiercely. We had previously been told that it is traditional among the Kombai to put on a show of fierceness to anyone who doesn’t belong to their clan. As they live in a state of almost perpetual warfare with their neighbors, they hope that this display will discourage visitors from coming back later and attacking. The constant fear of attack is also why the Kombai live in tree houses. Tree houses provide naturally fortified positions. Tree houses also provide a refuge from many of the jungle’s insects. Later, the women came out of hiding and there was a festive atmosphere. Both the women and the men dressed their upper bodies in fresh strips of green grass and danced around the compound. My friend took out her Polaroid camera and started to take pictures. It was the first photographs that they had ever seen. All night long the villagers were up talking excitedly about the photos that they had been given. One man said that he was happy that his son would now be able to remember him and what he looked like after he had died. Later, things quieted down a bit and a lone warrior wandered through the village. Note the new tree houses being built in the background. The Kombai usually move around every three years after they have harvested out the surrounding jungle and are thus often building new houses. I spent the night up in a tree house. I slept only sporadically in the heat and humidity. Each time I woke, I noticed that the man was up keeping a vigil over us. Mistrust of strangers runs deep in this land of constant inter-clan and inter-tribal warfare. The next morning, we thanked the village elders with presents of water proof matches and metal fish hooks. Our guide had to explain to them how to light the matches. They in turn gave us a gift of their favorite food–sago grubs. I politely ate one and then we left the village travelling further into the jungle in search of other remote clans.